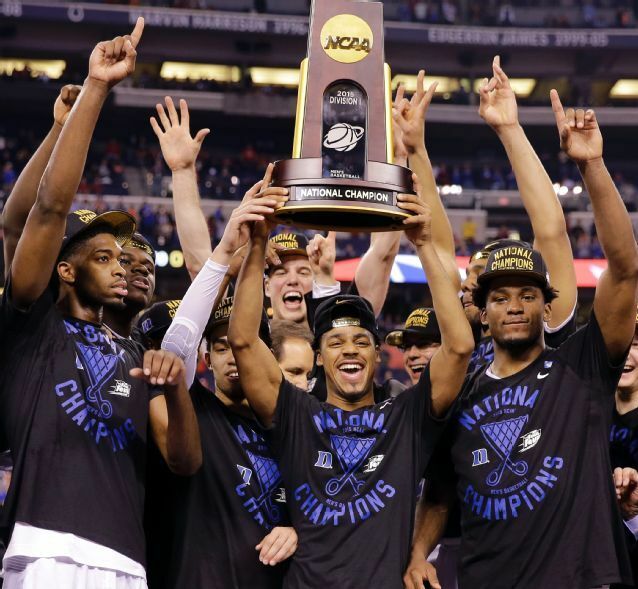 Duke won its 5th National Championship on Monday night, defeating No. 1 seed Wisconsin, 68-63. Tyus Jones was named the Final Four’s Most Outstanding Player, just as he was in last weekend’s South Regional in Houston. The game could not have been won without massive contributions from, notably, freshman guard Grayson Allen, and upperclassmen reserves Mason Plumlee and Amile Jefferson. A true team effort, Duke went on perhaps its most surprising championship run in school history. In 2010, when the Blue Devils won their last championship, it was an experienced team of overachievers who were not the best team in college basketball that year, but who simply continued beating every team in their path. That’s all you can really do in the tournament. Gifted a particularly easy bracket (if there is such a thing during March Madness), the Devils knocked out a Robbie Hummel-less No. 4 Purdue squad in the Sweet 16 and No. 3 Baylor in the Elite Eight, in route to a Finor Four. There, Duke somehow destroyed Bob Huggins’s best West Virginia team by 16 points before the more memorable title game against Butler. And, again, we’re talking about Butler. It was the birth of Brad Stevens’s marvelous coaching career (I hope very much that he is Mike Krzyzewski’s successor), but his roster was obviously inferior to Duke’s; Butler wasn’t actually supposed to win that game. When Gordon Hayward’s last-second half court heave didn’t go in, somehow, as a lifelong Duke fan my first feeling was relief. Relief that my favorite team wasn’t destined forever to be a punchline in the classic Who did Butler beat in that championship game? trivia question. In 2009, I was in my dorm room at Virginia Tech watching Duke’s final game of the season. It was a Sweet 16 matchup against Villanova — led by studs Scottie Reynolds and Dante Cunningham — and the Devils got absolutely killed. It reminded me a lot of when I was 14 years old, and some of us kids in PE would scrimmage the varsity basketball team. It was like a mid-major playing a team comprised strictly of Kyrie Irving’s. There was no question which team had the superior athletes, and it was not Duke that year. That was Greg Paulus’s final season in Durham. For all the hype, promise, and leadership everyone said he would bring to the table, by Paulus’s senior year he was little more than a pick-and-roll three point shooter. He was comically inferior on the defensive end and, by 2009, the college game had already began its evolution into quicker, more offensively gifted point guards, and a lot of them — Derrick Rose, John Wall, Brandon Knight, Eric Bledsoe, et. al — were going to Kentucky, college basketball’s premier program of this era. It was 2009 when Coach K realized he couldn’t continue his three-decade-long dominance of the sport with dinosaur guards like Paulus. He needed to catch up to the modern game, which is more like the NBA than anything else; it’s all about efficiency — basically taking as many layups and three pointers as possible — and to reach maximum efficiency, you need quick guards who can get into the lane for layups or drive-and-kick situations. And in 2014, it was Jahlil Okafor (#1), Tyus Jones (#7), Justise Winslow (#12) and Grayson Allen (#28), three of the top 30 players in the nation according to Rivals.com last year. Like I heard Bomani Jones say yesterday on Highly Questionable, by winning a National Title with four freshmen, Coach K didn’t only out-Calipari Kentucky’s Jim Calipari — everyone’s punching bag for everything that is wrong with the current one-and-done college basketball climate — he out-Calipari’d an entire sport. Mike Krzyzewski is a practical man, and practically speaking he knows there probably isn’t a way he could have won the 2015 NCAA Championship had he not decided to evolve with the times. Putting recency bias aside, the 2014-’15 season was my favorite Duke year, ever. Sure, I loved the Shane Battier-led team of 2001, the J.J. Redick years that overlapped my high school experience, and every team since. I have a connection, or love, for every Blue Devils team. But, let’s face it: championship years are better than non-championship years. By the time Okafor, the Joneses, Winslow and the rest of the gang were in the Final Four, I felt like they were playing with house money. Had they gone down to Michigan State, I would have been disappointed, obviously, but it wouldn’t have taken anything from the season. Just look at their schedule. Duke lost four games. The team was led by freshmen, almost exclusively, and you just can’t blow your wad on a bunch of youngsters when the lights shine brightest. Not usually, at least. This Duke team defied my lofty expectations. Unbelievably, I think, the Blue Devils managed to win multiple tournament games with its star players contributing very little. Okafor, in particular — the team’s best player and clear top-3 pick in the NBA draft in a couple months — was nearly nonexistent in the championship due to foul trouble, but Duke also beat Gonzaga and Utah with Jahlil scoring 15 total points in the two games. It shows you just how many weapons the Devils had — come March — that their top two scorers, Okafor and Quinn Cook, were reduced to mere cliff notes in the title game, as well as the entire tournament, really. March Madness will be remembered as Kentucky’s failed perfect season; as Justise Winslow’s coming out party; as Grayson Allen’s amazing ascension from bench player to folk hero overnight. It was a special year for my favorite basketball team. I cannot believe they actually did it. I’m proud of my guys, and until at least next March, we are again the champions of the sport. Over all, I appreciated this year. I’m 25 now, and I realize — unlike when I was a nine and ten year-old — that my team doesn’t compete for a championship every year. It’s special. This season, was special. I could keep writing, but by now you get what I’m putting down. Coach K has changed. Duke has changed. And yet, here we are and baseball has started and the Blue Devils are again the champs. The more things change the more they stay the same, I guess.